Women and children are struggling now, today, to carry Jerry Cans holding just enough water for the family to survive on. There is not a single drop spare for anything else. Donkey carts provide a good solution, transporting gallons of water at once. Imagine that! With your water cart in the village, a whole new world of hope opens up: Planting trees to hold back the desert and provide fruit to eat suddenly becomes possible for a whole community. Women and children are struggling now, today, to carry Jerry Cans holding just enough water for the family to survive on. They walk for many hours every day, carrying heavy loads. There is not a single drop spare for anything else. One of the ladies who recently benefited from one of our water projects had a massive hernia, and is so grateful that she no longer has to carry water over such long distances. Donkey carts provide a good solution, transporting gallons of water at once. Imagine that! With your water cart in the village, a whole new world of hope opens up: Planting trees to hold back the desert and provide fruit to eat suddenly becomes possible for a whole community. 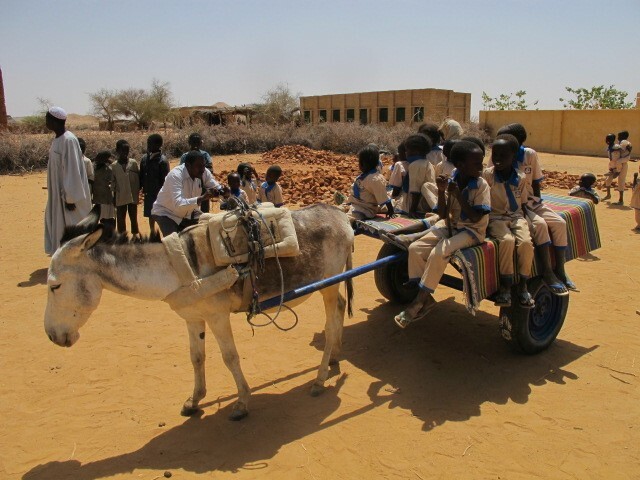 In those villages with a Kindergarten, the donkey cart also act as the school bus!